Special Time Limited Offer – Buy 2 pots of Jivesse Collagen Cream & get FREE Jivesse Collagen Capsules worth £80. Simply just pay the price of 2 Jivesse Creams and we will add the FREE Jivesse Capsules worth £80 to your order. The Cream will target signs of ageing from the outside by minimising the appearance of wrinkles, firming and tightening skin and increasing luminosity. The Capsule will rejuvenate skin cells, increase collagen production internally and improve skin hydration. 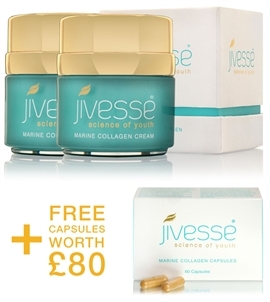 Special Time Limited Offer – Buy 2 pots of Jivesse Collagen Cream & get FREE Jivesse Collagen Capsules worth £80. This amazing time limited offer is great value for money - Total bundle price is worth £240 and for a limited time only you can get all this for just £119.98 - Simply just pay the price of 2 Jivesse Creams and we will add the FREE Jivesse Capsules worth £80 to your order. Look and Feel Good with this special offer - The Cream will target signs of ageing from the outside by minimising the appearance of wrinkles, firming and tightening skin and increasing luminosity. The Capsule will rejuvenate skin cells, increase collagen production internally and improve skin hydration. With 2 sources of Peptan® the collagen network in the skin can increase significantly in just 30 days. This multi-dimensional aging and hydrating cream contains potent active ingredients with unique properties which look to rejuvenate and accelerate the natural production of collagen within your skin. This process is vital to keeping skin looking youthful for longer and defending against the key signs of ageing. Incidences of deep wrinkle formation are reduced, skin appears firmer, with improved elasticity and moisture, providing more luminosity in skin tone with a youthful looking glow. Whilst the key active ingredients in the Jivesse Marine Collagen Cream are absorbed deep into the skin, the cream continues working, providing a layer of moisture on the skin surface ensuring the skin remains supple hours after application. The cream is enriched with Peptan®, the purest marine collagen peptides, which protect the extracellular matrix of the dermis, counteracting the loss of firmness and moisture occurring over time which would typically lead to wrinkles. The Jivesse™ Marine Collagen Cream has been formed using over a decade's experience and clinical knowledge in the development and manufacture of effective skin management products for dermatology specialists. Jivesse™ Marine Collagen Capsules are packed with a vast array of active ingredients, predominantly marine collagen, which all aim to provide key nutrients which look to reduce the development of deep wrinkle formation in the skin. This in turn promotes smoother skin appearance and a more supple texture with an increased level of hydration and youthful radiance. The vitamins included in the Jivesse capsules help to invigorate from within and allow the body to manage everyday activities and requirements to its best ability. The moisture content increased significantly. Skin elasticity and wrinkles were also improved. Fast absorption rates - specific peptides are released in the blood, less than 2 hours after oral intake of collagen peptides. Ingestion of collagen peptides increase the size of the collagen fibril, and enhances formation of the collagen fibrils. After 6 weeks, Peptan group volunteers had their micro-relief furrows decreased and after 12 weeks, the total wrinkle surface was improved. Strongly recommend this cream. I've already used more than four bottles. It is an amazing product, especially for acne skin. My skin is very sensitive, and this is the only cream that won't cause allergy. Every night I use it before going to bed, and my skin feels refresh and moist next morning. I love this product and absolutely recommend to everyone who has the same problem as me.